Among other things, February is known as the month of love. One reason why is probably because of the Valentine’s Day celebrations. As you are probably aware, that celebration holds on the 14th of February every year. In our post today, we share with you ten really funny love quotes that you can share with your spouse, girlfriend or significant other. We hope you enjoy these funny love quotes and encourage you to share them with your friends and family also. In our next post this week, we will share ten funny love quotes for him. We hope you found these quotes as funny as we did. If so, leave us a comment on which quotes you found the funniest. We would love to hear from you. Also, feel free to share this post on social media and with your friends and family. Love is a mixture of many things. However, one thing is sure, love is a funny thing. So today, we encourage you to spend some time with your significant other laughing. Go through these funny quotes and enjoy the pleasure of each other’s company. It will do you a world of good. If you have not already subscribed to our electronic mailing list, please subscribe to Innovate Today here. This will allow us to send you our funny and inspiring quotes directly by email. Also, if you really enjoyed this post, repost it on Twitter or share it with your friends on Facebook. Or follow us on Instagram. Our social media handle is @idscreate. 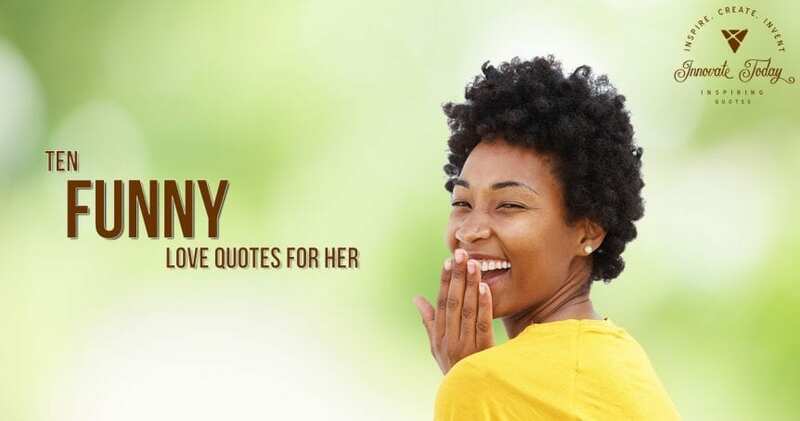 Feel free to leave us a comment on which quotes you found the funniest in our Comments section below. Have a great week ahead and see you again on Friday. Innovate Design Studios creates innovative web design solutions that provide you with a secure, custom designed web presence that promotes your business and generates revenue and exposure. Hi David. Thanks for your comment. We are glad you liked this post. If you would like to print these funny quotes, you can do so using the green print icon button on the left side of this page. Thanks again and have a great week ahead.